Each mL of Ketorolac Tromethamine Ophthalmic Solution contains: Active: Ketorolac tromethamine 0.4%. Preservative: Benzalkonium chloride 0.006%. Inactives: Edetate disodium dihydrate 0.015%; octoxynol 40; sodium chloride; hydrochloric acid and/or sodium hydroxide to adjust the pH; and water for injection. TORADOL ORAL (ketorolac tromethamine), a nonsteroidal anti-inflammatory drug (NSAID), is indicated for the short-term (up to 5 days in adults), management of moderately severe acute pain that requires analgesia at the opioid level and only as continuation treatment following IV or IM dosing of ketorolac tromethamine, if necessary. The total combined duration of use of TORADOL ORAL and ketorolac tromethamine should not exceed 5 days. Ketorolac Tromethamine Injection USP, a nonsteroidal anti-inflammatory drug (NSAID), is indicated for the short-term (up to 5 days in adults), management of moderately severe acute pain that requires analgesia at the opioid level and only as continuation treatment following IV or IM dosing of ketorolac tromethamine, if necessary. The total combined duration of use of oral ketorolac tromethamine and ketorolac tromethamine injection should not exceed 5 days. Ketorolac tromethamine is not indicated for use in pediatric patients and it is NOT indicated for minor or chronic painful conditions. Increasing the dose of oral ketorolac tromethamine beyond the label recommendations will not provide better efficacy but will increase the risk of developing serious adverse events. 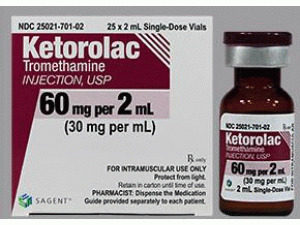 Ketorolac tromethamine can cause peptic ulcers, gastrointestinal bleeding and/or perforation of the stomach or intestines, which can be fatal. These events can occur at any time during use and without warning symptoms. Therefore, ketorolac tromethamine is CONTRAINDICATED in patients with active peptic ulcer disease, in patients with recent gastrointestinal bleeding or perforation, and in patients with a history of peptic ulcer disease or gastrointestinal bleeding. Elderly patients are at greater risk for serious gastrointestinal events (see WARNINGS). Ketorolac tromethamine is CONTRAINDICATED for the treatment of peri-operative pain in the setting of coronary artery bypass graft (CABG) surgery (see WARNINGS ). Ketorolac tromethamine is CONTRAINDICATED for intrathecal or epidural administration due to its alcohol content. 上一篇：Ketorolac 15mg 25X1ml(酮咯酸氨.. 下一篇：Tarlge Tablets 15mg(Mirogabalin..